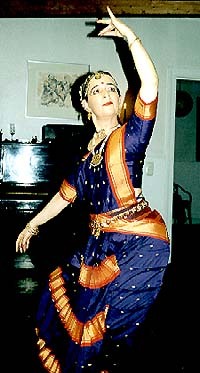 Annemette Karpen dancing Bharata Natyam at the planning conference in October 2000. In 1998, a Swedish government working group set up to intensify Swedish relations with Asia, made an inventory of existing Asia related research and educational resources in Sweden. The group recommended that a Swedish base for building academic competence about contemporary South Asia should be established at one of the universities in Sweden (Framtid med Asien. Förslag till en svensk Asienstrategi, Ds 1998:61, Stockholm, pp. 239 and 258). This recommendation was also included in the strategy formulated by the Ministry of Foreign Affairs. In June 1999 Sida invited the universities of Göteborg, Lund and Uppsala to send in declarations of interest how to best co-operate in building this competence about South Asia. A working group at Lund University, in consultation with the local South Asia researchers, worked out a plan for such a co-operation, which was submitted to Sida in September the same year. In this plan, Lund University committed itself to support the activity with SEK 0.5 million annually. A compilation of ongoing South Asia Research and Education resources at Lund University (Why is Lund University building the network?) was later presented at the SASNET first web site, and is still available. Go for it. In May 2000, Sida decided to give the responsibility to Lund University to develop a South Asia Centre according to the plan it had submitted. The funding was provided in two steps: for the year 2000 the amount of 0.7 million SEK was given, in order to present a detailed plan for such a centre, and if this plan was positively evaluated, an annual amount of 1.5 million SEK for the years 2001 and 2002 was guaranteed. Lund University set up a working group to plan for the building of a national network for South Asian studies. The group consisted of Professor Staffan Lindberg, Sociology; Associate Professor Olle Qvarnström, History of Religions; Associate Professor Rajni Hatti Kaul, Biotechnology; Mr. Shisher Kumra, International Institute for Industrial Environmental Economics; Mr. Jan Magnusson, Social Work; and Mrs. Boel Billgren, International Office. See the presentation on the working group at our first web site. The group also got support and assistance from Associate Professor Alia Ahmad, Economics; Assistant Professor Catarina Kinnvall, Political Science; Mrs. Anna Lindberg, History; Mrs. Sidsel Hansson and Mrs. Lisbeth Andersson, History of Religions; Associate Professor Neelambar Hatti, History of Economics; and Professor Göran Djurfeldt, Sociology. 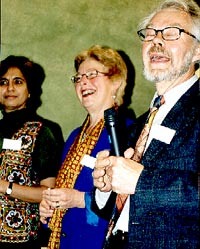 Rajni Hatti Kaul, Boel Billgren, and Staffan Lindberg, at the conference in October 2000. Lindberg was appointed acting co-ordinator and Magnusson acting programme secretary, and the first strategy was to organise a conference in order to plan the network better. On October 1415, 2000, around 70 Swedish South Asia researchers came together in Lund to discuss the formation of the new Swedish South Asian Studies Network (see http://www.soc.lu.se/sasnet/con/index.html). After the conference, a modified plan for the building of a network was submitted to Sida (see http://www.sasnet.lu.se/ourplan.html), and in November Sida decided to fund the activities for the period 20012002. Until the board had been fully established by the middle of 2001, our work was monitored by a reference group consisting of Mr. Tomas Kjellqvist and Mr. Jan Essner (Sida), Professor Gunnar Jacks (Royal Institute of Technology, Stockholm), Professor Bo S Lindblad (ICHAR, Karolinska Institute, Stockholm), Professor Gunilla Gren-Eklund (Dept. of Indology, Uppsala University), Associate professor Hans Blomkvist (Dept. of Government, Uppsala University), Professor Björn Hettne and Mr. Bent Jörgensen (PADRIGU, Göteborg University), Associate professor Kjell Härenstam (Dept. of Religion, Karlstad University), and Professor Pamela G Price (Dept. of History, Oslo University). SASNET got an office at Gamla Kirurgen in central Lund (connected to the Lund University International Office), and established its web site during the Spring–Summer 2001 after Lars Eklund had been employed as webmaster. Directions were issued by the Lund University vice-chancellor on in June 2001, and a board was elected for the period 2001-2003. See the full list of the members of SASNET’s first board, and also a photo of the beautiful building in which SASNET was located till November 2003 (before the move to Ideon research village), as a pdf-file. For information on the present organisation, the board, the staff and the address, see our organisation page.